It's that time of year again - the sun is out a little longer, March Madness is in full swing, and the NBA and NHL playoffs are right around the corner. Every point counts over the next three weeks, and teams will continue to scrap in hopes of claiming a postseason berth. This week's top NHL games list will be fronted by a Wednesday night battle between the New York Rangers and Boston Bruins at Madison Square Garden as both squads look to further cement their right to play on through April. Move over, Islanders - the Rangers have new standings neighbors in the form of the red-hot Penguins, whose six-game win streak has left second place up for grabs entering play Monday night. The Rangers will hope to take down the Atlantic-leading Panthers tonight, but it will be Wednesday's home game against the Bruins that is generating the biggest price points on the secondary market. The average resale price for New York Rangers tickets on the secondary market against the Bruins is now $356.57. If looking just to get in at MSG the cheapest ticket is now $94. Also feeling the heat down the stretch are the Chicago Blackhawks, who now find themselves in third place in the Central division after a 10-game stretch where they went just 4-4-2. They'll host the Detroit Red Wings on Saturday in what will be the second most expensive game this week. The average secondary market price for Chicago Blackhawks tickets against the Red Wings is $217.06 and the get-in price is $89. The Red Wings are flirting with the possibility of snapping their current 24-year postseason streak should they not clinch a berth. While many teams are battling for every last point, the Capitals are gearing up to lift the President's Trophy by the end of the regular season. 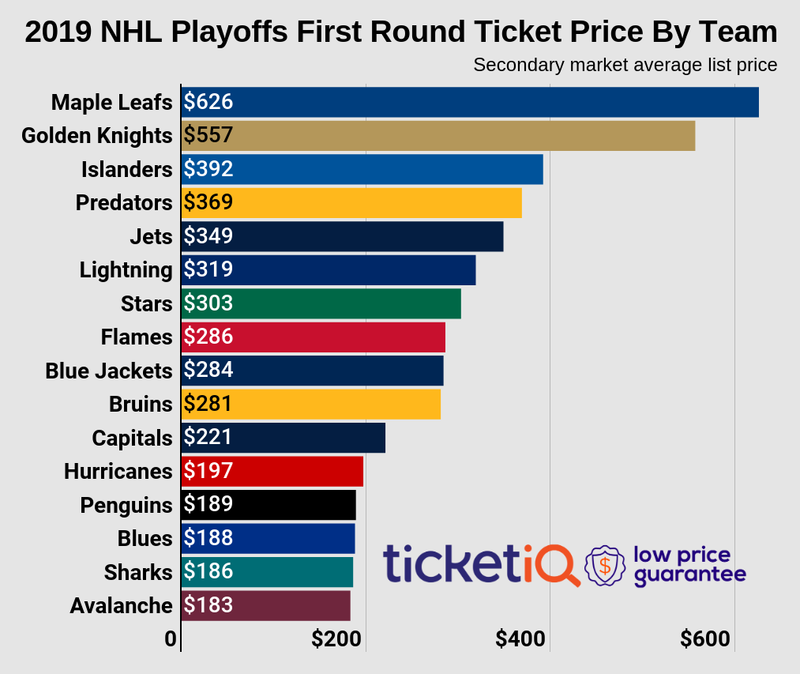 They'll host the St. Louis Blues on Saturday, where Washington Capitals tickets on the secondary market average $190.10 and the cheapest ticket is listed for $80. The Blues currently sit in second place in the Central division with 93 points and have gone an impressive 7-3-0 over their last 10 games. One the league's best will clash with one of the worst on Saturday as the Pacific-leading Los Angeles Kings host the cellar-dwelling Edmonton Oilers at Staples Center. Despite another season of forget in Edmonton, Connor McDavid has had a promising rookie season and will likely be considered among the game's elite players before long. His presence is likely driving prices in L.A., and the average price for Los Angeles Kings tickets on the resale market is $150.86 against the Oilers. The cheapest ticket is now $58. A playoff berth doesn't appear to be on the radar for either the Minnesota Wild or Calgary Flames, but their game on Thursday is still generating big price points on the secondary market. Minnesota Wild tickets against the Flames now own a resale average of $149.51 and a get-in price of $61.